Every year for the past ten years our staff has attended the PGA Merchandise show in Orlando to see what the game has bringing us for this year. For some, it is their same game on the course that may not have changed from last year, but the tools of the trade have. What is interesting is that solid focus on the golf ball market. Its almost like a box of Lucky Charms anymore on the golf course, only its who has the best technology inside of the ball and the best outside color at the show this year. We have checked out the Volvik product before, but its the new colors and a few new tweeks that they have made in the core of the ball. What was cool was seeing some of the World Long Drive players out and about and stopping in for autographs in their booth and checking out their matte grey finish on the balls. As always it seems every year the training aid section of the show seems to get bigger and bigger. This year was no exception. One product that stood out for us and we will be reviewing this very soon was Strike Spray. This product spritzes a substance on the face of your golf club, allowing you to see precisely where you make contact on every shot, and won’t leave a permanent mark on your club or ball. As off-center strikes are the No. 1 cause for amateurs losing distance, by illustrating the pattern of your misses, you can get to the root of your swing problems and begin to get your game back on track. There are so many new clothing options for Spring and Summer and ones that stood out this year were the amazing line from Travis Matthew and of course some new options from Loudmouth Golf and their partnership with the wild man himself John Daly. 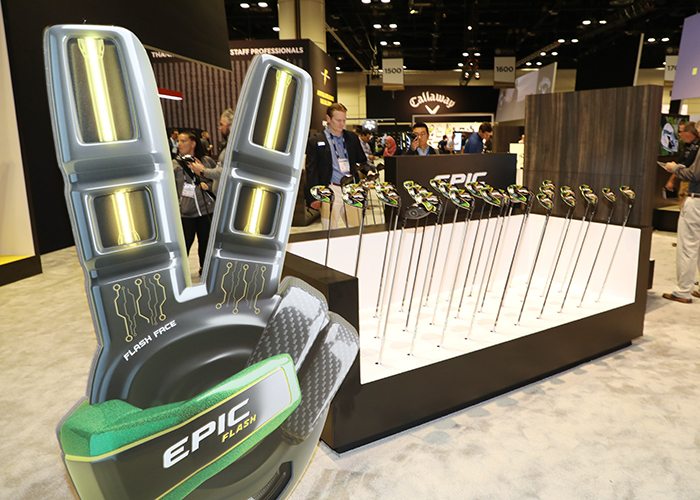 So whether you are out for some new threads or aiming to improve on your game, check out some of the upcoming product reviews over the next few months and see what the golf world showcased here in Orlando.